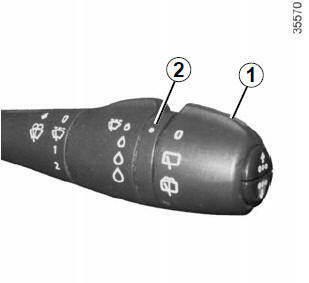 With the ignition on, turn the end of stalk 1 to align mark 2 with the symbol. When the stalk is released, it returns to the rear wipe position. If the windscreen wipers are operating or are in automatic mode, the rear screen wiper wipes intermittently when reverse gear is engaged. Before any action on the windscreen (washing the vehicle, de-icing, cleaning the windscreen, etc.) return stalk 1 to the park position. Risk of injury or damage.